I like the fact that this Daily Fiber Formula (Orange Flavor) Powder by Yerba Prima has different kinds of fiber included. It taste's great. Meet your body’s daily fiber needs and support digestive health with Daily Fiber® Formula (Orange Flavor) Powder – 16 oz (454 Grams) from Yerba Prima®. This pleasant tasting fiber supplement contains minerals and natural sources of fiber. Soluble fiber from the seed husks of psyllium reportedly work as a bulk-forming laxative in your intestine and promote bowel movement. It may also reduce blood glucose and lipid levels and boost metabolism. Psyllium could potentially inhibit the growth of harmful cells in your body and support gastrointestinal health too. 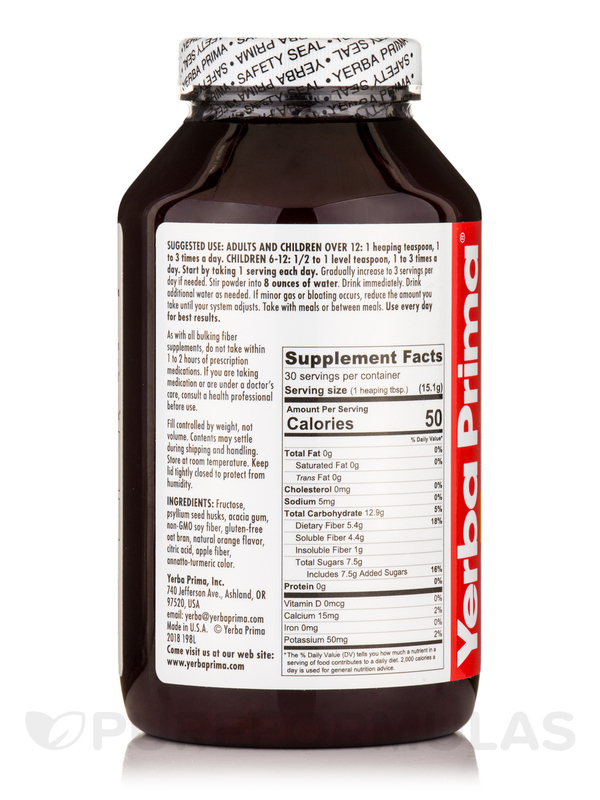 The presence of acacia gum in this health supplement from Yerba Prima® helps alleviate digestive issues‚ relieve respiratory conditions‚ and support certain facets of heart health. Soy fiber could potentially ease conditions related to your heart‚ blood vessels‚ kidneys‚ bones‚ and thyroid gland. Oat bran and apple pectin reportedly alleviate gastrointestinal conditions‚ fatigue‚ and joint pain. 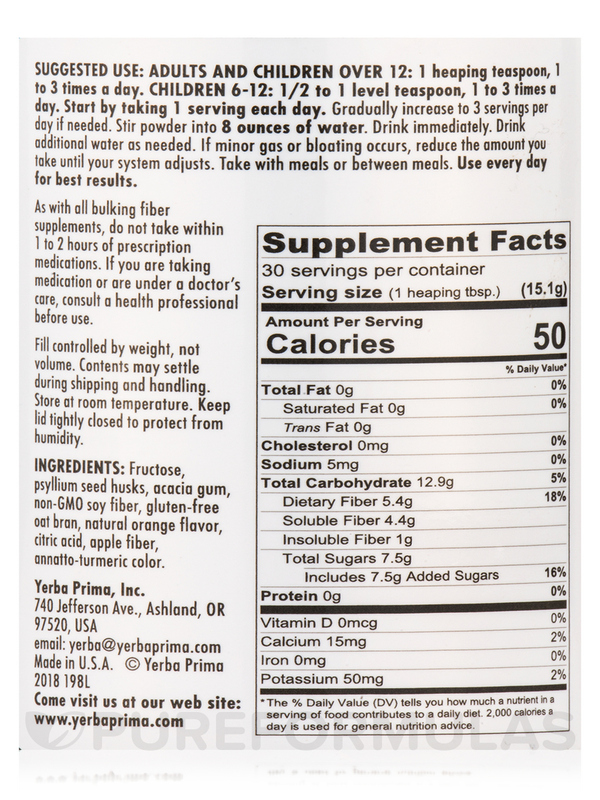 These natural sources of fiber in Daily Fiber® Formula (Orange Flavor) Powder – 16 oz (454 Grams) from Yerba Prima® may also reduce the absorption of fat and glucose from the gut‚ keep away heart conditions‚ and more. 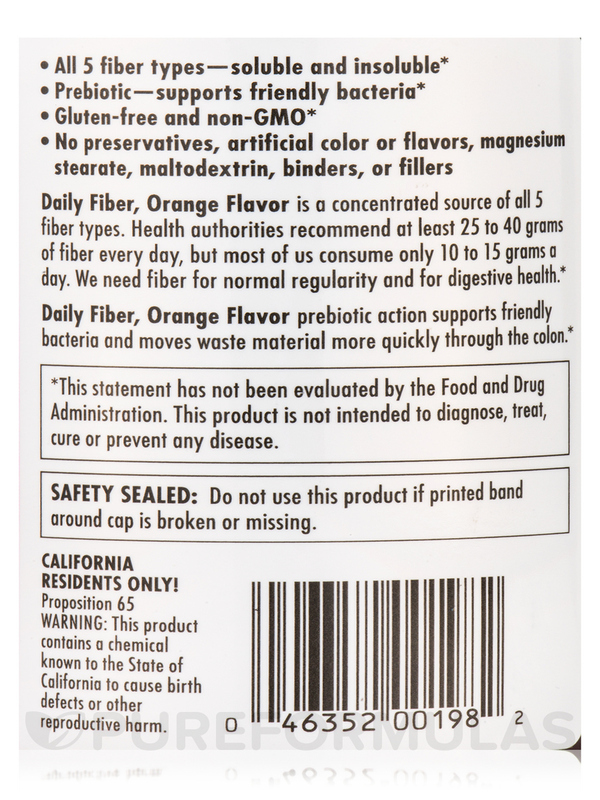 Ingredients: Fructose‚ psyllium seed husks‚ acacia gum‚ non-GMO soy fiber‚ gluten-free oat bran‚ natural orange flavor‚ citric acid‚ apple fiber‚ annatto-turmeric color. Start by taking 1 serving each day. Gradually increase to 3 servings per day if needed. Stir powder into 8 ounces of water. Drink immediately. Drink additional water as needed. If minor gas or bloating occurs‚ reduce the amount you take until your system adjusts. Take with meals or between meals. Use every day for best results. 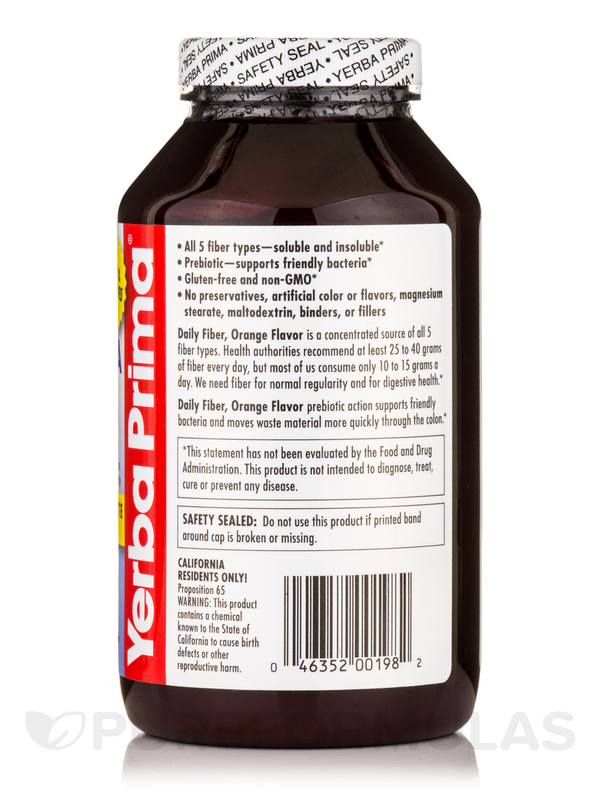 Ordered Daily Fiber Formula (Orange Flavor) Powder by Yerba Prima 4 months ago, great deal! Re-ordered it again and got the sugar free version instead. I have had sugar free before and it tastes like chalk. Going round and round with customer service to get a return label and refund. Love this item but customer service said it is no longer available. Can't get it anymore. Do not order the sugar free version unless you like consuming chalk dust!! Great product at a geat price! Daily Fiber Formulas by Yerba Prima works great! I would highly recommend it! It tastes good and works great and is very easy to use. I switched from the Y.P. 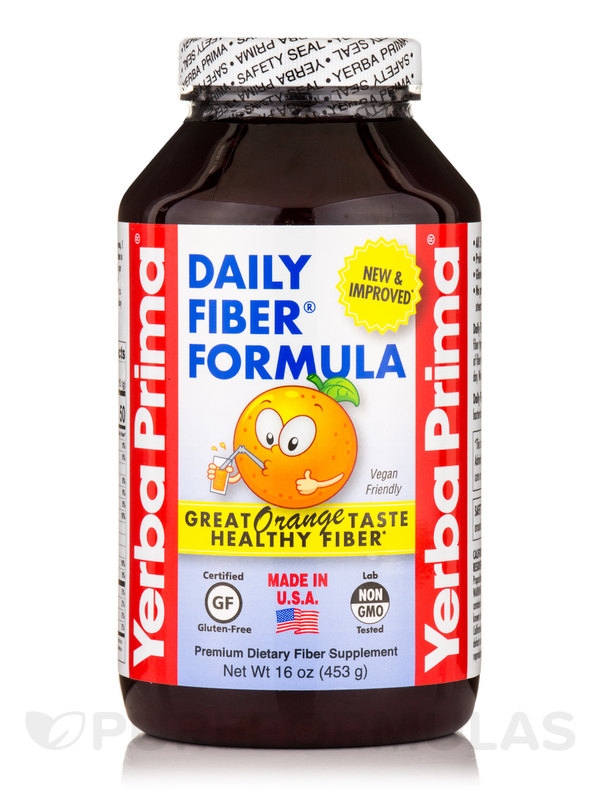 Daily Fiber Formula by Yerba Prima to the Orange flavor as soon as it came out, and have not used the original since. The orange flavor and slight sweetness makes the supplement much more palatable. I actually use two tablespoons per morning dose without any unpleasant choking, gagging etc. that can arise from the plain fiber supplements. Try it, you may like it :-D.